Ken’s artwork has been published by the National Wildlife Federation, American Bear Association, Pioneer HiBred International, Ducks Unlimited, Indiana Department of Natural Resources, the National Exchange Club and many others. Ken’s acrylic paintings of waterfowl and game birds have been popular in the Indiana Department of Natural Resources art competitions for the Indiana Duck Stamp, Game Bird Stamp and Hoosier Outdoor Calendar. Ken’s winning entries in these competitions were selected from other entries that were submitted from around the country. Ken is the all time winner in all three competitions, being a six time winner of the Indiana Duck Stamp, ten time winner of the Indiana Game Bird Stamp and eight time winner of the Hoosier Outdoor Calendar competition. The winning original paintings are in the permanent collection of the Indiana State Museum. Ken’s waterfowl paintings have also been popular with Ducks Unlimited and have helped raise many thousands of dollars for the preservation of wetlands. He was selected four times as their Indiana Artist of the Year and has been a six year area chairman and thirty year committee member of the White River Chapter of Ducks Unlimited in Bloomington, Indiana. Ken’s traditional oil paintings have been multiple award winners in the annual Hoosier Salon and Indiana Heritage Arts Exhibits. 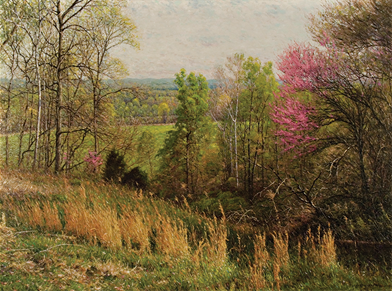 His oil painting, “Overlook Near Freedom”, was awarded Best of Show at the Indiana Heritage Arts exhibit in 2010 and he is the all time Popular Choice artist in the history of the exhibit. “Overlook Near Freedom” now hangs in the permanent collection of the Brown County Art Gallery Foundation in Nashville, Indiana. Many of Ken’s paintings are in private, corporate and museum collections throughout the country. Ken prefers painting in his studio, although each spring he competes in a plein air, oil competition. Every April the Indiana Plein Air Painters Association, along with the Hoosier Salon, sponsor the popular “First Brush Of Spring” paint-out in New Harmony, Indiana. “I like to prove to myself and everyone else that I can do it, and it’s a highly regarded competition to participate in.”, stated Ken. He has came away with the Best of Show award from the “First Brush of Spring” competition, along with other awards, and every year he has sold the painting he created during the event.